Aside from adorable pet videos, sometimes I think the internet was really invented for silly cat photos! 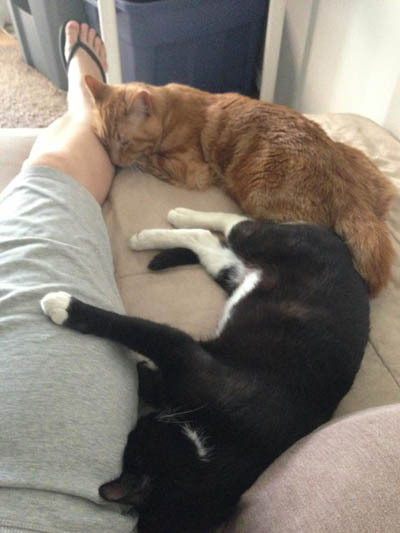 Our friends over at Petcentric came up with the idea to post seven photos of cats sleeping and they are each cuter than the next, and that inspired us to go through the archives of our foster cat and kitten photos to find all the cute cat sleeping photos we’ve taken over the years too! Vallo, pictured at right, is one prime example. He would sleep like that with his belly up and a big kitty smile on his face all the time! 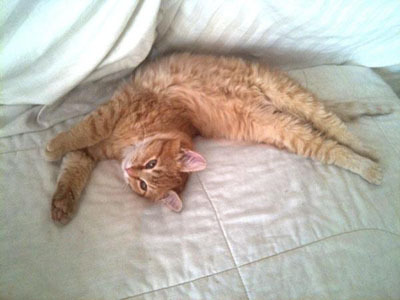 There’s not much cuter than a happy sleeping kitten or cat, and they can get into some pretty silly positions when they sleep too! 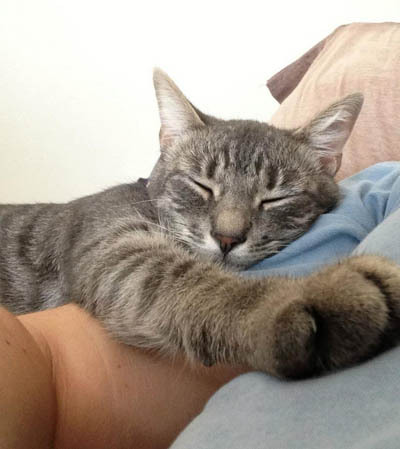 Petcentric adds, “On average, cats sleep 13–14 hours a day. Lucky for us, that gives us tons of time to observe their funny and unique sleeping habits. Here, we’ve uncovered seven sleepy cats. Look through quietly — we wouldn’t want to wake them!” Here’s the link to see Petcentric’s seven sleepy cats, and click the “more” link at the end of this paragraph to see the photos we picked to share with you here too. 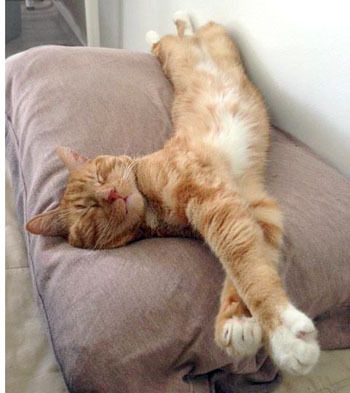 If you have a cute photo of your adopted cat or kitten sleeping, you can share it on our Facebook page here! You can share our photos with your friends easily too by clicking one of the icons below. 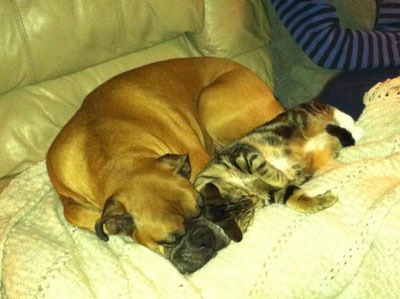 Amelia’s adopters sent me this photo of her sleeping snuggled up with their dog. Maggie Mae would sleep with her paw stretched across me in a kitty hug. 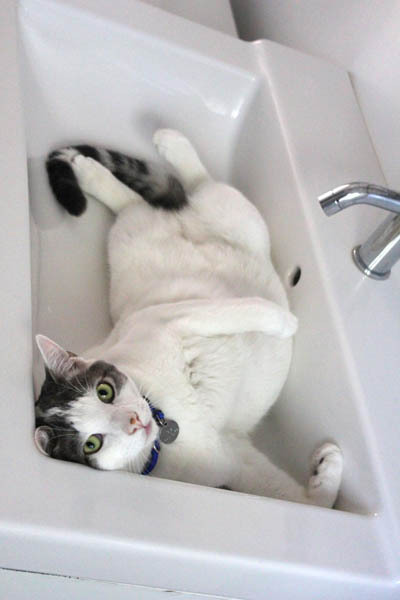 Valentino loved to sleep in sinks! 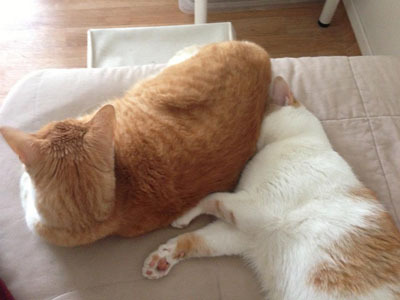 George was sleeping so soundly, he couldn’t be bothered to move when Alfred sat on him! A shelter kitty curled up sleeping in a donut bed. 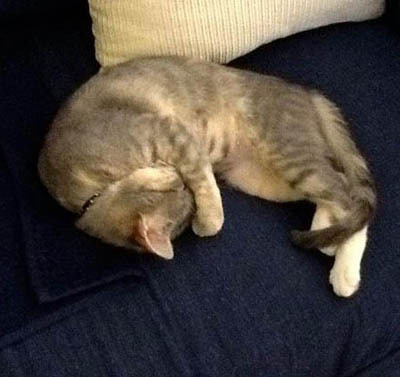 Kate’s adopters sent me this adorable photo of her sleeping! 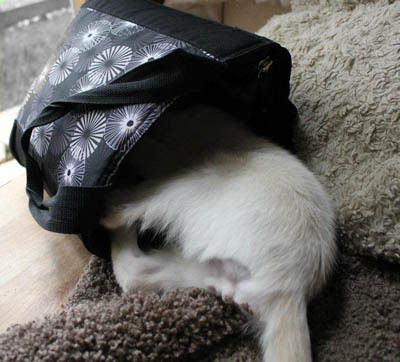 Silly foster kitten sleeping in my camera bag! Huckleberry another of my belly-up foster sleepers! Victoria would sleep snuggled up with as many people or other kitties as possible.